Hello crafty gals! Yesterday, I put together a vibrant peony and lavender wreath for our red front door. I like it so much, I want to share it! 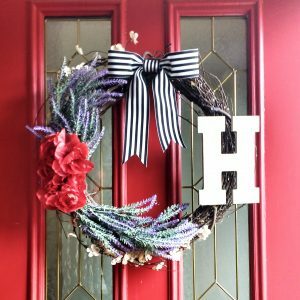 The vivid combination of red and purple in gardens always catches my eye, so I decided to use that color combo in my lavender wreath diy. I painted the monogram letter a cream color with latex sample paint and a small foam brush. I used wood glue to attach twine to the back of the monogram letter, then tied the letter to the wreath. Next, simply arrange your faux flowers on the wreath until you think they look just right. I positioned the red peonies so they cover the plain green stems of the lavender. Next, just go to town hot gluing! To make the bow, I cut about a foot of the 2.25″ to make the loops of the bow, and about 9″ for the tail. I used a few inches of 1.5″ ribbon for the loop to hold the bow together as the center “knot”. OnSuttonPlace has a great tutorial for making bows! I used hot glue instead of stapling, but her method is similar to what I use, cutting the three separate pieces to form the bow. ← DIY Conduit Curtain Rods with Glass Finials and DIY Curtain Brackets, Create a Gorgeous Look that Matches Your Decor!